Breathe in! Human oxyhaemoglobin. 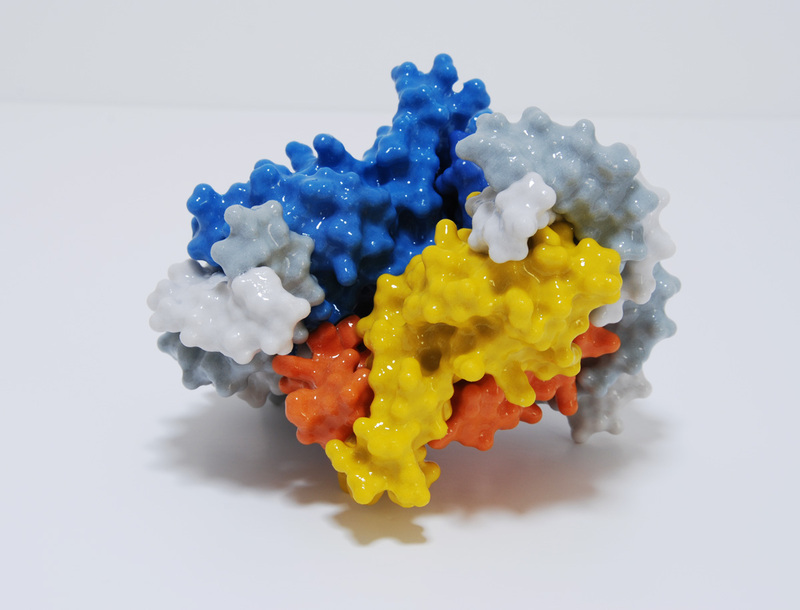 This glossy model shows the four subunits of haemoglobin. Four subunits of haemoglobin. 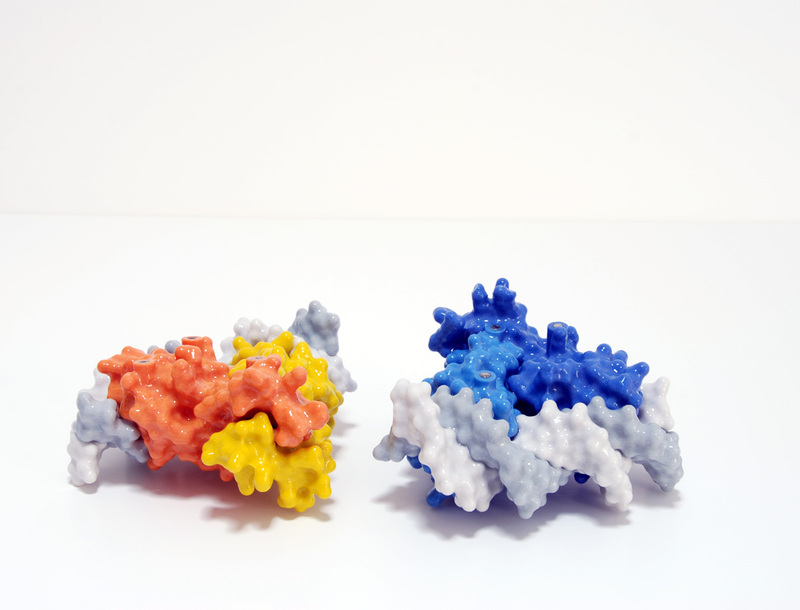 The two alpha subunits are in white and black; the two beta subunits are in light and medium grey. 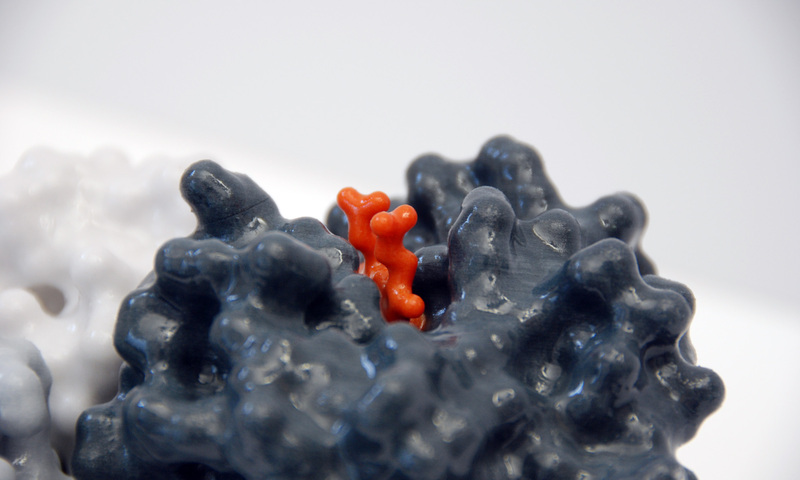 The haem group in each monomer subunit is in red and shows where an O2 molecule binds – four dioxygens per haemoglobin tetramer. 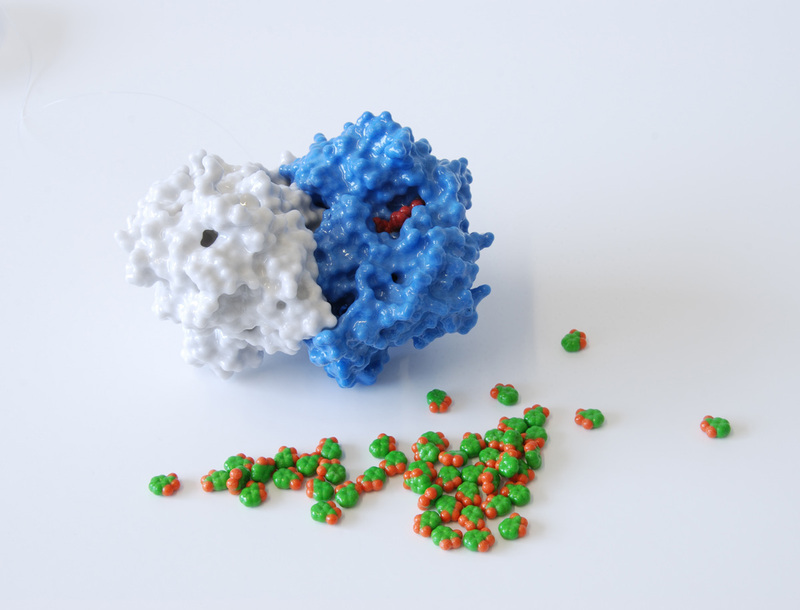 Cut-away model through the middle of haemoglobin to reveal the complex polypeptide chain folding inside the molecule. 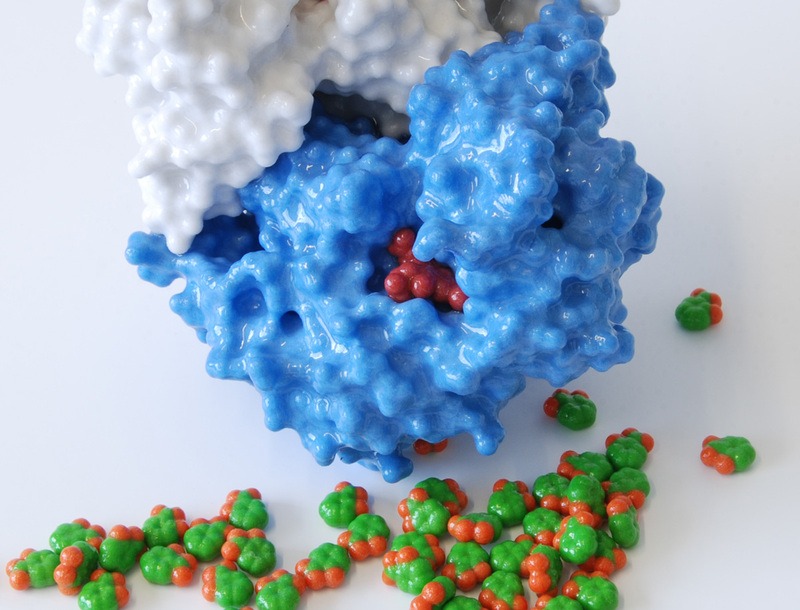 How aspirin works: structure of the enzyme cyclooxygenase 2 (COX-2). 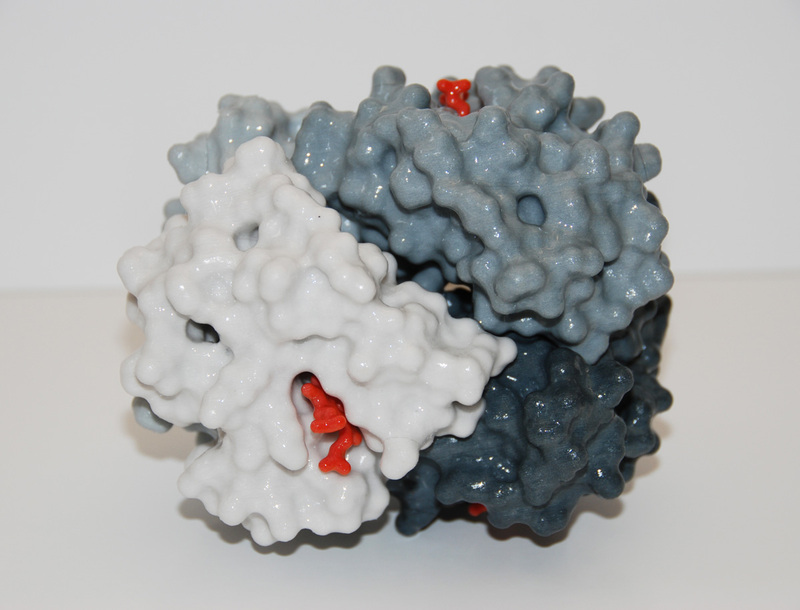 COX-2, is a homodimer and in this model the subunits are coloured white and blue; the haem group in each subunit required for prostaglandin synthesis is shown in red. COX-2, also known as prostaglandin H2 synthase, is inhibited by the anti-inflammatory drug aspirin. Aspirin molecules are shown to scale alongside. 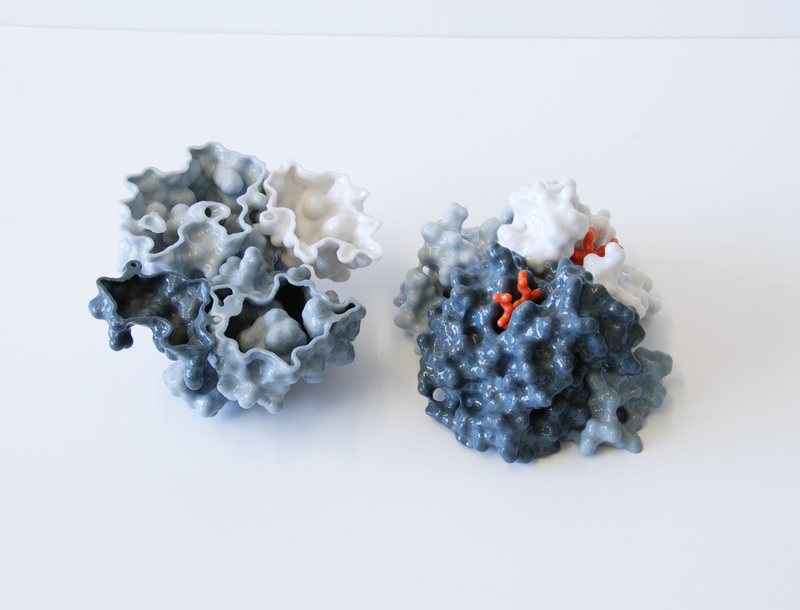 Model made for the Biochemical Society outreach team. 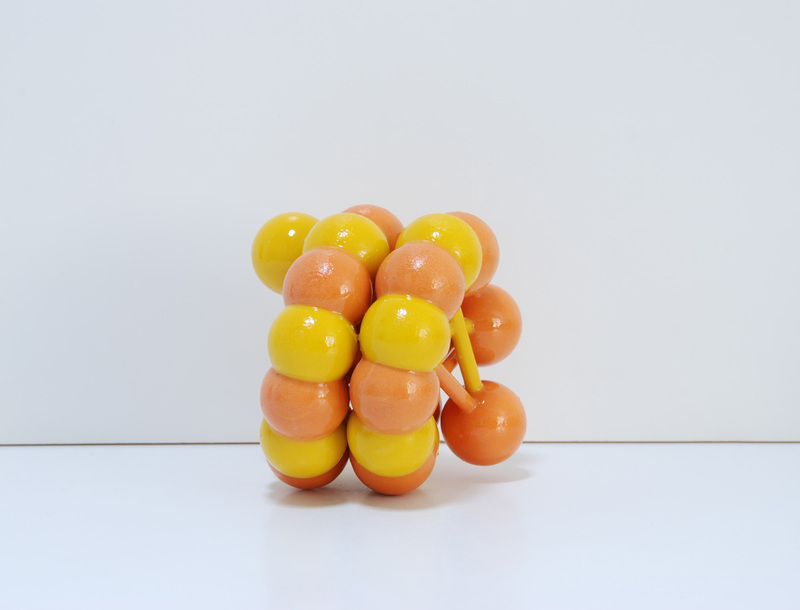 This 2 part magnetic model shows how the complex assembles. 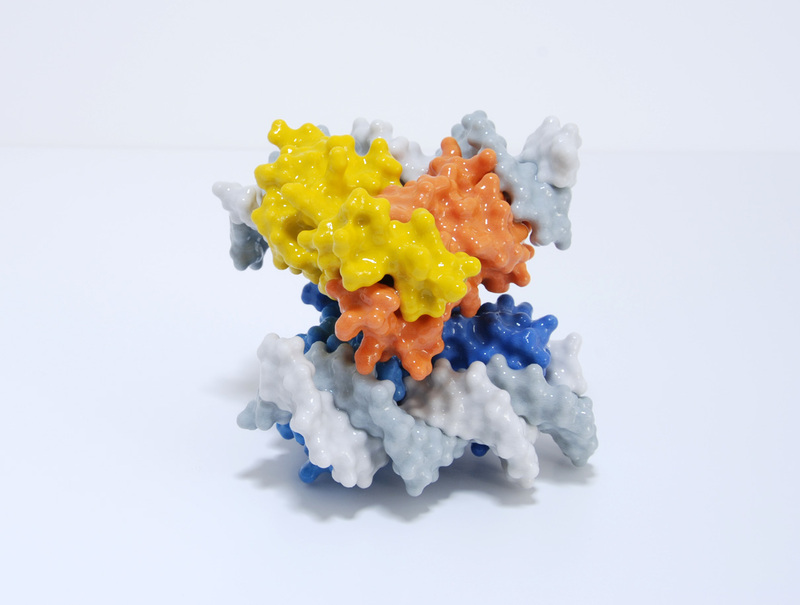 Structure of the Restriction-Modification controller protein C.Csp231I. 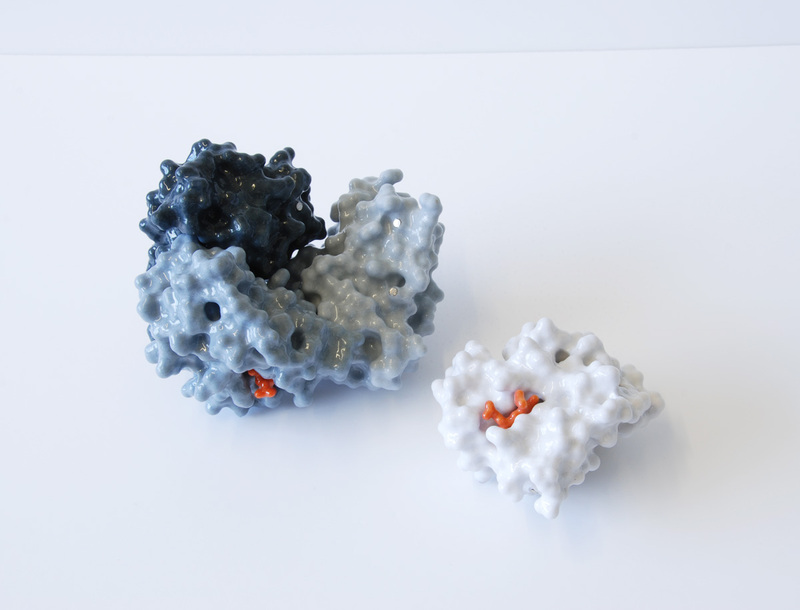 This protein consists of two dimers (orange/yellow and light/dark blue) that interact to hold the DNA in a loop. 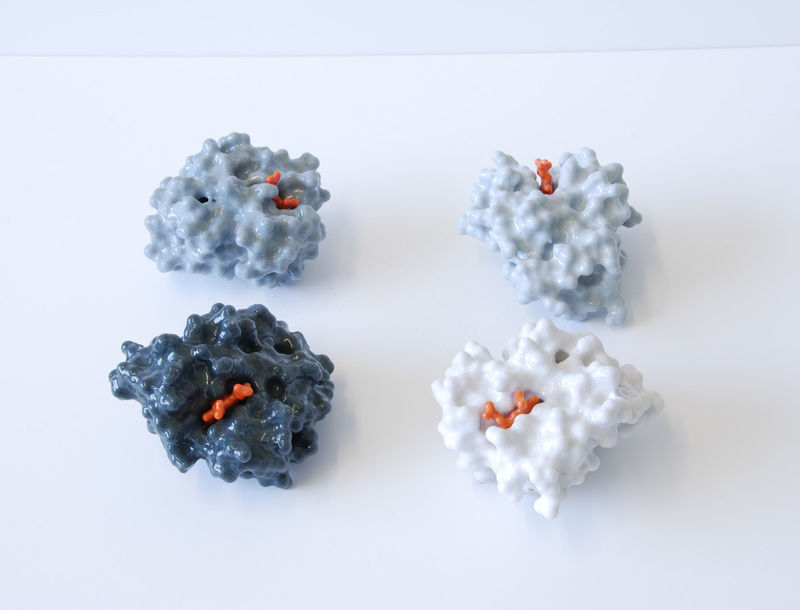 Six models of the 50 nm nucleosome fibre. 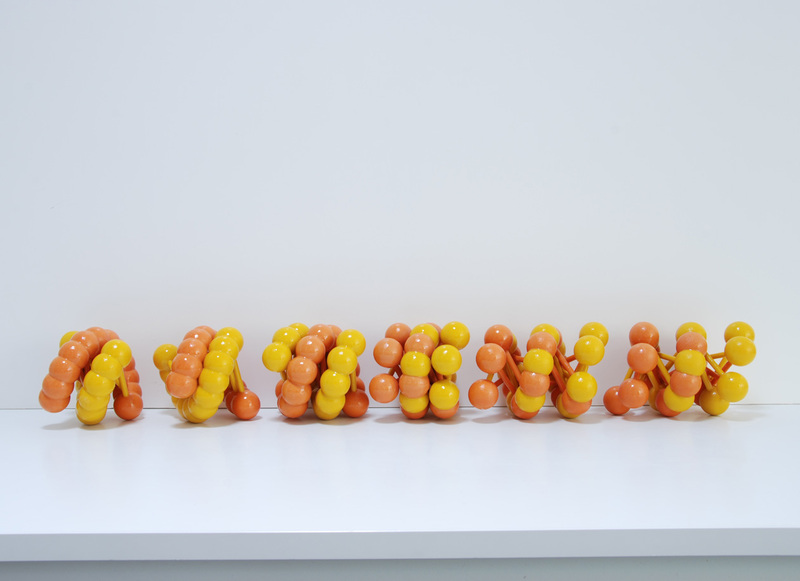 Each model represents a different theoretical inter-nucleosomal spacing; nucleosomes are shown as yellow and orange spheres. 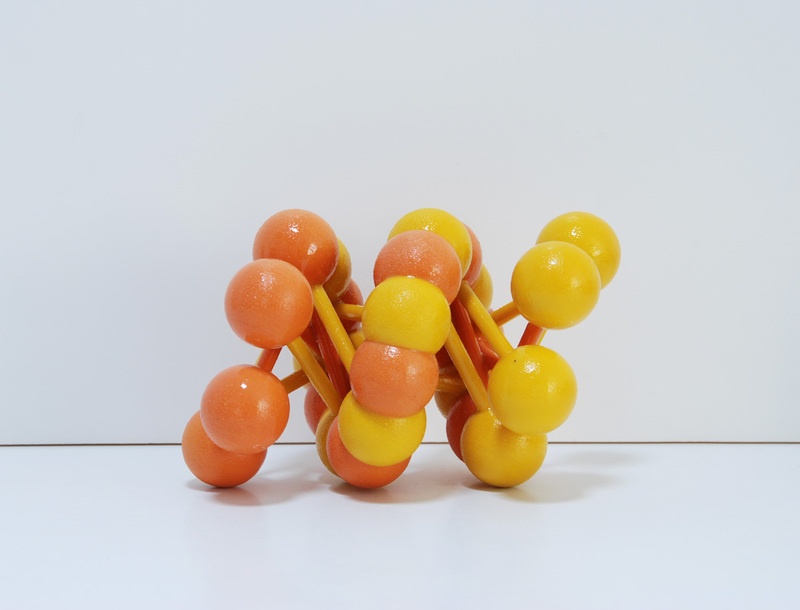 These images shows how useful physical models can be for inspecting and evaluating molecular structures.